This full-day combination tour offers travelers an extensive look at the culture, lifestyles, and history of Peru. You’ll tour the city of Trujillo and the UNT Museum, the Arco Iris Temple (El Dragon), the archeological complex of Chan Chan, and the fishing village of Huanchaco. Trujillo flourished during the Spanish colonial era. Sugarcane farms boomed and helped finance impressive churches and large houses. 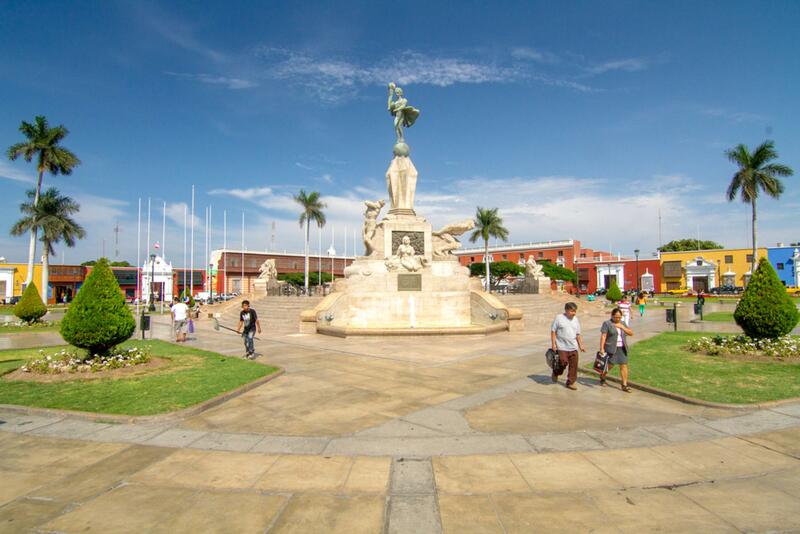 As you explore Trujillo, you’ll see colorful colonial mansions and well preserved cathedrals. The craftsmanship and architecture of these structures is spectacular. While here you’ll also visit the University of Trujillo’s Museum of Archeology and History. The museum has exhibits on Peruvian culture and history, and is a fantastic place to learn about ancient Peruvian civilizations. The university is also helping excavate the temple of Huaca de La Luna and has many objects from this site on display. At the Arcos Iris Temple, also known as El Dragon, you’ll see a structure that was built by the Chimú people around A.D. 1200. The adobe temple has two platforms that are adorned with carved motifs and niches used to store ritual objects. Local legends describe this temple as being the home of Takaynamo, the mythical man who founded Chan Chan. Chan Chan is the largest pre-Columbian adobe city in America and was declared a UNESCO World Heritage Site in 1986. Chan Chan was the capital of the Chimú empire, which stretched from Chancay (near Lima) to Tumbes. During its heyday, Chan Chan was an elaborate city with high walls, courtyards, gardens, and terraces. Around 30,000–60,000 people are thought to have lived here. Finally, your tour will visit Huanchaco, and ancient fishing village where you can still watch local fishermen fish in the same way they have for hundreds of years. The fishermen use traditional reed rafts called “Caballitos de Tórtora” to go out into the ocean and fish. Camera, comfortable clothes/shoes, and sunscreen. Transportation, guide, lunch and entrance fees.